Online Course - The online portal for sterile processing education, training, and professional development. The most comprehensive sterile processing course of its kind...NOW COMPLETELY ONLINE! Learn the basics of sterile processing online, in the convenience of your own home/department for ONLY $300.00. Act now and save over $100! Enroll today, start class in 24 hours...work at your own pace! Access course in 24 hours upon payment thru your e-mail. About the Course...Thank you for visiting our site and your interest in our educational products. The Central Sterile Processing Initiative is proud to offer its international best‐selling course, Sterile Processing Basic Training Course, live and online, for a registration fee of only $300.00 (course fee subject to change at any time). One of the primary goals of The Central Sterile Processing Initiative is to provide for relevant, convenient, and affordable educational opportunities to both active and aspiring sterile processing professionals (individuals as well as entire departments). This course is our first effort toward that goal and has been utilized by hundreds, just like you, to accomplish their goals, whether professional certification or continuing education, departmental training/in-servicing or simply for good old-fashioned review. The course currently consists of *12 individual modules (though more are being developed and added regularly). Obtain the knowledge and the skills you need to succeed as a sterile processing professional… (at a cost LESS than the price of a textbook!) You will receive a comprehensive textbook/workbook combined in digital format with multiple media presentations providing for a comprehensive student retention‐oriented learning experience (texts, photos, graphs, embedded resource links, video, audio, course forum, weekly online chats with your instructor, exams, and more!) all for ONLY $300.00! This course is both comprehensive and complete, focusing solely on the "fundamentals" of Sterile Processing--those things EVERY tech and sterile processing professional MUST know (from the equipment tech to the OR Director!) For those interested in transitioning into careers as sterile processing techs, this course will provide you with the theory and credential necessary to enter the field as an entry-level Tech I. * For those who have been working in the field for some time but lack the theoretical base required to attain the next level, professional certification, this course will help both equip and prepare you. The course also serves well for a general, but thorough, review for even the most seasoned sterile processing professional. Access instantly online all course instructions, study materials, assignments, quizzes, and exams! Once you enrol and are taken through the checkout process, upon receipt and confirmation of payment, our system will forward you a special web link and password to access the currently posted course modules or Student will receive the first module with corresponding quiz on it in 24 hours via email. You can begin class immediately and work at your own pace. Students may work at their own pace. An average student, studying 3-4 nights per week should be able to complete the program within a few months or so. The goal is to prepare individuals and equip them to work in the healthcare setting--a setting in which lives often depend upon our knowledge, our skill, and our routine actions. Not only do we hope to convey the fundamentals of sterile processing, but also to help our students to better understand those fundamentals and how they fit together as part of the overall process. An emphasis is upon both process and critical thinking. At all times throughout the course, students will have live access to their instructor. Each class is limited to 25 e-students so that we can ensure that your needs are met and that you receive our full attention. You may contact your instructor at any time via e-mail, an online forum, during regularly schedule class chats, and via the sterile processing forum. For certain modules (particularly the more difficult and lengthy ones, e.g., the sterilization modules), a chat room will be opened at specific times throughout the week for open discussion and question and answer sessions with the instructor(s). *All students are encouraged to join the online sterile processing forum. We are here to help you both learn the field and to succeed. We only succeed when you do! Upon course completion, a comprehensive final exam (consisting of 50-100 questions) will be posted on the course site. The exam must be proctored. The paperwork to validate proctor is included with the examination packet. Students have up 60 days post course to complete the examination. The exam requires an 80% pass rate (not the typical 70%).. Exam retakes may occur once every 30 days until the course is passed (additional fee assessed in the amount of $30.00 per additional exam if required). Once the final exam is completed with an acceptable pass rate, a handsome certificate of completion and module transcript will be mailed out to the student at no additional charge (included in the course fee). Graduates will have their names listed on the Central Sterile Processing Initiative web site as well for employer verification. We also provide educational reference to all of our certificate holders--something no other organizaton offers! Everything that the student needs is included with the course. There is NOTHING more to buy--no textbooks, no workbooks--NOTHING. Everything that you need will be available to you upon enrollment and on the site for instant download. Are you ready to enroll in our Sterile Processing Basic Training Course? Then don't wait! Slots are limited and going quickly. ENROLL TODAY! For only $300.00 you could be on your way toward an exciting new career in sterile processing or advancing your current station and stature in the field. Knowledge is power—knowledge is patient safety! Managers and department heads, register your staff in our program today and witness your departmental productivity double, your technicians take on a new pride with their newfound knowledge and skill, and your patient safety statistics increase for the better. Start building your team today with our online sterile processing course. Training together, increases team cohesiveness--let us help you build a better and stronger team. You simply can't go wrong with our course! $300.00 is such a very small investment for a credential demonstrating that you (or your department) have become expert with the concepts of the essentials of sterile processing, demonstrated your motivation for advancement and dedication to your profession, and your laser‐like focus on patient safety. Enroll today, you have no reason to wait. Seats are limited at this special rate. Want to earn more money? Advance in your sterile processing department? Become an independent sterile processing consultant? Enter the field of sterile processing? Traing and build your team? Add a better understanding of sterile processing to your repetoire (e.g., infection conrol practitioners, OR staff, nurses, etc.)? Enroll today. We can help you meet your goals as they relate to the field of sterile processing. Act now, slots are limited and this special offer won't last long! 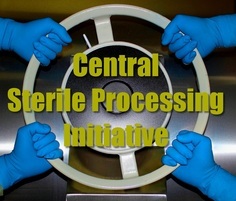 The Central Sterile Processing Initiative's driving purpose is to provide for more educational products and services that are both accessible and affordable for the average sterile processing professional. As such, you will only find products and/or services advertised on this site to be quality products that can and will enrich your professional life in the field of sterile processing. This is doubly so of our own products. We stand behind our curricula 100%. Within 30 days, if you find that the content of our course isn't as described above, we'll issue you a full refund--no questions asked! There is no risk and nothing to lose. *The Central Sterile Processing Initiative cannot guarantee employment upon completion. Module reviews and final exams consist of fill in the blank, multiple choice, and essay questions. Module titles and content may vary as the course progresses and depending on instructor. Modules may often be combined. The content or quality of the course will not vary. Instructors reserve the right to change module post times (depending on student completion rates) and grading. Refunds subject solely to terms of guarantee above. Prior to enrollment, please add e-mail from contact@centralsterileprocessing.net to safe sender's list in your inbox (to ensure automatic receipt of login information). Certificate of completion will either be mailed or delivered electronically.